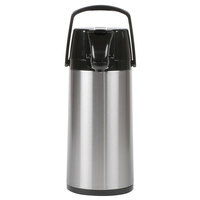 Keep your piping hot coffee warmer longer with this Choice 1.9 liter (64 oz.) vacuum insulated airpot! This glass lined airpot keeps coffee warm for 6-8 hours and is perfect for establishments where it's necessary to hold coffee for a long period of time. Thanks to its convenient swivel base, this airpot is easily accessible to patrons no matter which direction they are coming from. The Airpot keeps the coffee hot (not warm) for several hours. it is very easy to clean and can be used for my old coffee brewer too. This product is not worth buying. After six months, the glass inside completely shattered. This item was only used once every other day so it did not see heavy use. Highly recommend never buying this product. We appreciate your feedback! We’re sorry this didn't work out for you. If you are looking for a recommendation on a different unit, please feel free to reach out to our Customer Solutions team for assistance. As long as we remember to heat the glass inside up with hot water first, this will keep the coffee hot for about 2 - 3 hours. Side note: I ordered two and one came with the glass inside shattered. I told Webstaurant via chat and they sent a replacement super fast. Very easy! Thank you for your feedback, Jonathan! Our Customer Solutions team was happy to assist you with your damaged airpot. This is a great product at an even better price! Compared to buying from my local food distributor this was a steal. Product is very nice looking and works well. Not the best quality but also for the price it’s hard to find a better deal. We bought two that we used as our backups whenever we have big events where we need additional airports for coffee or hot water. Nothing to complain about with these airpots. They keep our coffee hot and they pour easily. Choice is the best way to go for airpots. The value is impossible to beat. We use these regularly for events where we serve hot chocolate. They are the best price. Only downside is they are a little difficult to clean since the head comparement is screwed shut and the spout does not break into parts for better cleaning. They still work great however. glass interiors tend to break suddenly when coffee is brewed into them, switched to stainless steel version, no problems at all. Love the stainless version. We're sorry you had trouble with this item. Glass-lined airpots can break due to temperature shock or mechanical shock.A temperature shock occurs when boiling water is poured in a glass-lined airpot that is drastically colder than the hot water. Airpots can also shatter due to microfractures caused by damage when being transported. To get the most use out of your glass-lined airpot, it is advised to pour warm water into the airpot to make the transition of a hot liquid less drastic for the first use of the day. If you have questions, please feel free to contact our Customer Solutions team! This is a nice airpot! When we received it, it had a small crack on the top inside plastic. Webstaurant Store handled it very professionally and sent us a new one right away. We purchased this one because its the correct size to go with an airpot coffee brewer we wanted to get. This is a nice quality airpot for the price. Nice stainless look on the outside. Carrying handle is convenient too. These aren't high end pots but do the trick. This stainless steel airpot with lever dispenser is great for any reception, motel, café or office setting. Top handle is great for carrying and airpot is super easy to use. I bought this coffee pot to use at our wedding, it was the perfect size and was able to accommodate all of our guests. If I ever have another big event, I will purchase again. This product does not hold up as well as other brands. I have had the liner explode, pieces come apart, and have proven very difficult for my staff to handle. Thank you for your review. We are sorry you did not prefer this product, for recommendations please contact our Customer Solutions team! Great Alternative to the Name Brand Unit. This 1.9 Liter airpot is still glass lined and stainless steel which means it holds temperature well and is easily cleaned. We use these pots many, many times a day and they can keep up with the demands of a busy morning. The lever makes pouring coffee easy and quick and it keeps our coffee hot for hours! We go to a lot of events and have been considering getting these for some time now. We couldn't be happier with our decision. These work so well, they keep your beverage fresh and warm. This airpot works really well keeping things warm. I will say the size is slightly deceptive and doesn't hold as much as it looks like, but does hold the advertised amount. A big positive is that it breaks down for easy cleaning from the bottom. A good product for occasional use. We use this for hot water for teas and French press coffee. The glass makes it so it retains heat really well, allowing us to always have hot water available. These are not bad airpots, and for the price I shouldn't be complaining. The reason I gave it 3 stars is that I bought 2 and one was faulty and did not pump the coffee. That being said the customer service I received from Webstaurant was fantastic and they addressed the problem quickly and efficiently. The glass lined airpot keeps the hot coffee hot for over 6 hours. I even tried holding it overnight and it was still very warm. I would highly recommend it. I am the owner of Victory Tea Co. - www.victoryteacompany.com , we bought 3 of these for sampling our teas at our store, farmers markets, & festivals. They are perfect for what we needed. We serve hot & iced teas here in New Jersey during the hot summer as well as the cold mall in our store. When I put hot or iced tea in the air pots it will stay at whatever temperature at the time of filling the air pots for hours. We went to clean them the next day after our first use and the tea was still almost as hot as when we put it in at that I almost burnt my hand. This is perfect for serving hot tea on cold days and iced tea on warm days. the price is extremely reasonable. I will be buying more to sample a larger variety. We set up a hot chocolate/cocoa bar and this is our must have piece for storing hot water. Just the right size and very functional. The restaurant is primarily outdoor seating. All of our coffee brewing equipment is downstairs, so by the time the coffee makes it to the tables on our ocean desk, they are cold. The Airpot is excellent at keeping coffee piping hot and fresh. Its decent entry level air pot. Its small but gets the job done. For light use not a problem at all. Its a great buy. Nice product! Taller than I envisioned but keeps liquids hot throughout the day. need a tutorial to see how to take out the glass flask for cleaning. We use these airpots in our shop to serve coffee and hot water. The top comes apart which makes it easy to clean. They also keep the beverage hot and fresh for 4-6 hours. This airpot looks and works great. Its heavy so it will not tip easy. It has a great on and off feature that the cheapo ones do not have. This allows you to move it without accidentally spilling coffee. Very good price. I was a little skeptical about airpots and how long they would keep something hot/cold. After purchasing one and working so well, we purchased three more. They keep coffee hot/cold for more than 8 hours, which reduces our waste. I own 4 of these for when I have smaller parties, and want to keep multiple hot beverages piping hot for hours. My guests loved them, and asked where they could get them. Liter Glass Lined Stainless Steel Airpot with Push Button has been a great airpot to keep our coffee or hot cocoa warm for our outside vending events. The 1.9 Liter Glass Lined Stainless Steel Airport with Push Button. It is great we put our specialty coffee in this with a label telling customers what flavor it is.The customers love it. The 1.9 Liter Stainless Steel Airport with Push Button is great.I've been looking for a great way to keep my favorite brew hot.It holds 12 cups of coffee or hot cider. The price is right. This is an excellent stainless steel airpot! Keeps freshly brewed coffee hot for hours! Great inexpensive addition to any home! Comes apart for easy cleaning! This airpot has treated us good. It will hold a whole 12 cup brew and keep it warm for hours. If you preheat it with hot water while you are brewing, then pour it out and pour in the brew, it will stay warm longer, even up to 12 hours on some occasions! I was concerned when looking for a glass coffee carafe that I wouldn't find one that was well enough insulated to keep the coffee hot and fresh throughout the day, but this one is perfect. As soon as my coffee brews, I pour it into the airpot and it's there when I want it, hot, and not burnt-tasting. No need for microwave warm-ups. I highly recommend this item.